Scan to Bim is the scanning department of Precision Surveys Limited, headed up by David Buffini and Peter Cunningham. 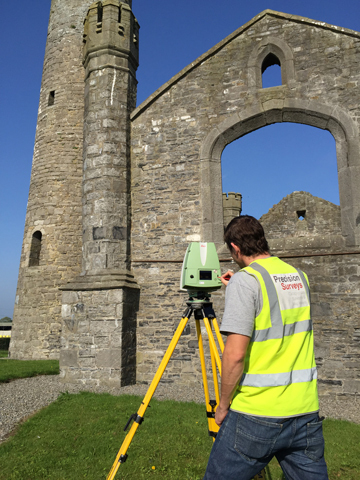 We offer a comprehensive consulting service orientated towards providing the most comprehensive laser scanning to CAD and BIM services in Ireland. Precision Surveys have been at the forefront of surveying for almost 40 years, using the latest in technology to offer the best service to our clients possible. We take pride in the fact that all our surveys and BIM work are produced in-house, and our team are always available for advice on which survey technology is right for the client. These services include, Laser Scanning to BIM, Laser Scanning to CAD, Topographic Surveys to BIM or CAD, and computer generated images and animations. With the latest technology all our BIM models can be formatted for Virtual Reality with our in-house hardware. Contact us for a demonstration. The company is fully insured and is also completely covered for general liabilities. Precision Surveys Limited is a member of the Society of Chartered Surveyors Ireland (SCSI) and the Royal Institute of Chartered Surveyors (RICS).